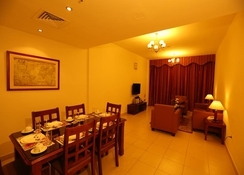 The hotel is located in Al Muhaisnah 4- near Lulu Village- Al Ghusais- Dubai. 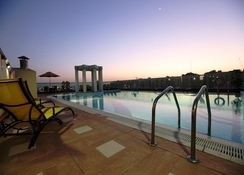 It is 5 minutes from the Emirates motorway and the beach is some 9 km away. The property's strategic location also allows its residents and visitors easy access to the other Emirates including Sharjah- Ajman- Fujairah and Ras al-Khaimah. It takes 15 minutes to reach Dubai International Airport (approximately 5 km). The hotel offers guests superbly laid-out- extra large- fully-fitted studios- 1-bedroom and 2-bedroom apartments on a daily- weekly- monthly or yearly basis and for those looking for true luxury a Royal Suite that redefines luxury living. It is ideally suited to corporate clients as well as the discerning leisure travellers visiting Dubai who are looking for a stay out of the ordinary. Renovated in 2009- the air-conditioned hotel features a lobby with a 24-hour reception- a hotel safe- currency exchange facilities- lift access and a hairdressing salon. Guests may dine in the on-site restaurant. WLAN Internet access- room and laundry services and a car park are also available at the hotel. The studio and apartment amenities include a state-of-the-art-kitchen fully supplied with crockery- cutlery- cooking utensils- a washer/dryer- refrigerator- microwave- kettle and tea and coffee making facilities; a 32-inch LCD television with satellite/cable channels- a DVD player and a radio with hi-fi sound system- as well as high-speed Internet access in all rooms. In each apartment there is also a safe deposit locker- individually controlled air conditioning- international direct dial telephone- double beds and an ironing set. Housekeeping is on a daily basis for daily bookings and three times a week for monthly bookings. The hotel offers guests superbly laid-out, extra large, fully-fitted studios, 1-bedroom and 2-bedroom apartments on a daily, weekly, monthly or yearly basis and for those looking for true luxury a Royal Suite that redefines luxury living. It is ideally suited to corporate clients as well as the discerning leisure travellers visiting Dubai who are looking for a stay out of the ordinary. 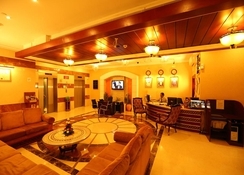 Renovated in 2009, the air-conditioned hotel features a lobby with a 24-hour reception, a hotel safe, currency exchange facilities, lift access and a hairdressing salon. Guests may dine in the on-site restaurant. WLAN Internet access, room and laundry services and a car park are also available at the hotel. Featuring balconies, the polished studios offer microwaves, minifridges and sitting areas, plus free Wi-Fi, flat-screen TVs and DVD players. The 1- and 2-bedroom apartments add kitchens and separate living/dining rooms. 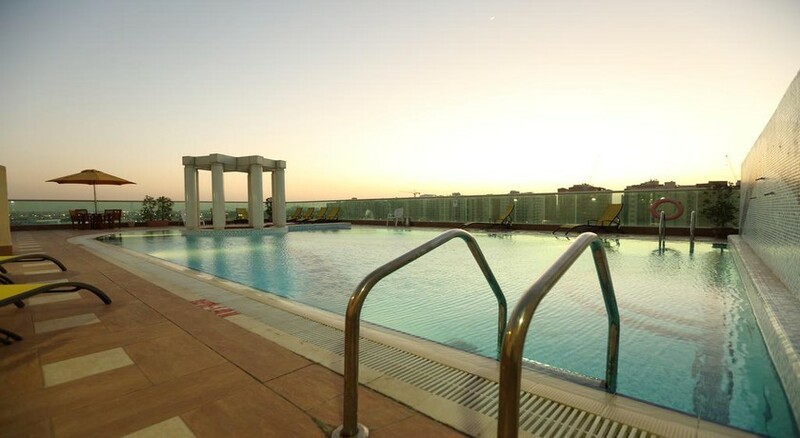 Set in a commercial area, this relaxed, all-apartment hotel in a modern, glass-accented building is 9 km from Adventureland amusement park and 14 km from shopping and indoor sky-diving at City Centre Mirdif. A local shuttle is complimentary. 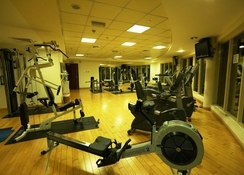 There's an outdoor pool, as well as a steam room and a fitness center, both with men's and women's areas.